I loved reading Eben Alexander’s book Proof of Heaven: A Neurosurgeon’s Journey into the Afterlife. When it was first published, I mentioned the book to a friend who is a theological school professor and minister. Although I strongly endorsed the book, and thought she would be eager to read it as well, she gave me reason to pause when she said, “I do not need to read a book to know Heaven is real.” Actually, she was right, about her own belief, and my belief as well. Whether we view heaven as another dimension or a higher plane of existence, etc. I know such a place is real. I did not love Alexander’s book because it made heaven more real to me, I loved it because it made heaven, or even the possibility of heaven, more real to many who prior to reading his book were inclined not to believe heaven was real. Eben’s is an important voice among those of us who work in the area of consciousness studies and transpersonal psychology. Although many of us–researchers, clinicians, practitioners and scholars that we are–share his interest in science and value our scientific background, and many of us have similarly impressive educational credentials, unlike Dr. Alexander, we have shown interest in this field of study for many years, if not decades, and are long established believers, and/or “knowers” of these truths. Eben does not have a long and established history in this subject matter; however, as a highly regarded academic neurosurgeon who was a physician on the staff of Harvard Medical School, with a particularly strong scientific understanding of the brain, his becoming a great believer in the reality of experiences and knowledge that a mere few years ago he would have readily dismissed as unimportant (from a personal and a scientific point of view) is striking, and particularly impressive to readers around the world–even among former skeptics whose views regarding the afterlife changed after reading his book. some innate aspect of all life forms exists eternally.” I encourage you to visit ETERNEA. This entry was posted on Friday, March 8th, 2013 at 5:52 pm	and tagged with Afterlife, Near-death experience, science, Spirituality, theology and posted in Near-death experience. You can follow any responses to this entry through the RSS 2.0 feed. Thank you so much for your blogg on an excellent book and an intriguing subject. Can’t wait to read more! I appreciated reading this . . . thanks for the link as well. I believe the widely published author and lecturer Deepak Chopra, MD, is inclined to view consciousness as spirit. Personally, I think there are different types of consciousness. At this point in my thinking, I am not willing to state that soul or spirit and consciousness are exactly the same thing, but at some level maybe they are? Perhaps, it may make more sense to claim that one’s spirit has “cosmic consciousness” as opposed to saying that one’s spirit is “cosmic consciousness.” I’ll just have to see where I am in my thinking down the line, perhaps even years from now; although hopefully, it will not take that long, as I continue to ponder your question, and finally come up with a personally satisfying answer. I have just finished reading Proof of Heaven and found it very interesting. I am a retired RN and have also had questions such as you describe. However I have had an experience that I can’t relate as a NDE since I was not near death; but it was an out of body type dream that left me with this awesome sense of a pure love that can not be described in normal human language. It was overpowering and I felt glowing for days after and even now as I relate to it. I had lost my husband 2 years prior and the visionary dream involved him and I knew it was an ending. I actually saw a bright yellow square with a huge eye inside it and I knew it was God. It was not scary at all and was an overpowering feeling of love and warmth. I related to knowing without words what was happening and I instantly knew that I was witnessing God. I remember saying I have to go back…I am needed yet and immediately I was back. It certainly made me unafraid of death and a knowing that there is something out there much greater than this earth we are on. Thank you for your bravery and honestly in your book. 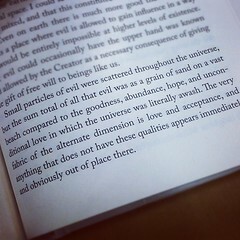 I am so lucky to read Eben Alexander’s book. Proof of Heaven. My son had an experience here where he talked to my departed sister Gwendolyn and she described a beautiful place where my mother and grandmother were and herself and they garden and animals are there. So, when he spoke of heaven and seeing his sister there it made me a true believer. I thought the book was great and I believe Dr. Alexander was actually given a view of Heaven. I don’t doubt a word that he wrote. I think, however, the story isn’t over. I think Dr. Alexander was given a glimpse of hell and then was allowed to see what Heaven would be like so he could make sure he would never end up there. What a wonderful second chance. Satan, himself, knows there is a God. To know there is a God will not get you into Heaven when you die. Before Jesus came into the world, people made sacrifices on an alter to God for the forgiveness of their sins. Jesus is the sacrificial Lamb of God who takes away the sins of the world. John 3:16 “For God so loved the world, that He gave His only begotten Son, that whoever believes in Him should not perish, but have eternal life.” Without asking Jesus to forgive your sins and inviting Him into your heart to dwell in you, in the form of the Holy Spirit, you will not enter Heaven. My prayer is that Dr. Alexander has accepted Jesus and somehow I just missed that part as I read the book. Amazing experience!! I just finished Proof of Heaven. I can’t document a personal experience but I have a 35 yr old traumatic brain injured daughter. Her car accident was 1995 age 16..stuck in car hour cut out. Emergency over hr. We were told total brain injury broken arm and pelvic area they went about necessary surgeries put in induced coma and on life support as far as I can remember it all took a life of its own 7 weeks in ICU very high pressure on brain. We signed donor forms and took off machines..it was not her time.she came around but never talked she followed with eyes. 3 months in Charlotte rehab. Home for 5 yrs intensive therapy I remember first half smile. No one thought she was going to do anything. Life goes on divorce moved to care facility more surgeries on things. Feeding stop feeding all the regular things of one unable to move. Forward now will Be 20 years in May. The reason I write is you give me a peace. I have always said she is locked in but understands everything. As she has been with a lot same caregivers since 2007 most know she loves people going places men especially. She laughs smiles shows she knows some and pouts. It’s all facial. But for someone who has sat for almost 20 yrs I can’t imagine but everytime I pray and talk about Jesus she smiles. I have thought everytime I bet she had a experience but there is no way to document until God gives her speech again. She is such a loving girl and just lives for attention there is not much a 67 yr old mom on ss can do. The state has done well and God places her in a place where she has shown more alertness. I know God is aware of her and I can’t know his purpose but reading these stories helps me keep hope and to know we will move past this some day. Thank you.